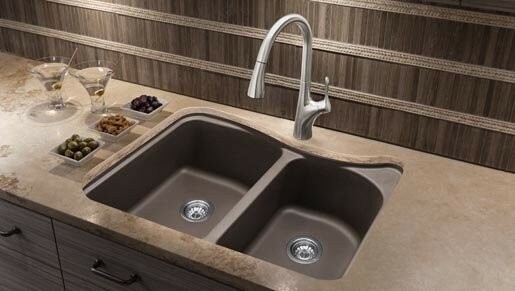 Product Features: Sink is covered under Blanco's limited lifetime warranty Premier finishing process - will resist staining, chipping and scratching through every day use Double basin sink with a 60/40 split provides increased versatility for any task Blanco sinks feature extremely hygienic, non-porous surfaces Constructed of Blanco's SILGRANIT II material - making it durable and fade resistant Installs in a drop-in or undermount configuration - providing a sturdy mount and integrated look Rear drain location increases workspace are in the sink as well as storage space underneath Required clips for undermount installation type are not included - when adding sink to cart these will be presented as an option for purchase This Blanco Sink comes with 1 faucet hole ready for use, and 3 prepared "knock-outs" to create additional holes for use. Product Benefits: SILGRANIT II: Crafted of 80% natural granite, this composite features the look and feel of natural stone and resists scratches, stains, chips and heat. Colored all the way through SILGRANIT II will not fade in direct sunlight and is impervious to household acids and alkalis. Advanced surface technologies ensure that it will be non-porous, easy to clean and an extremely hygienic workspace. 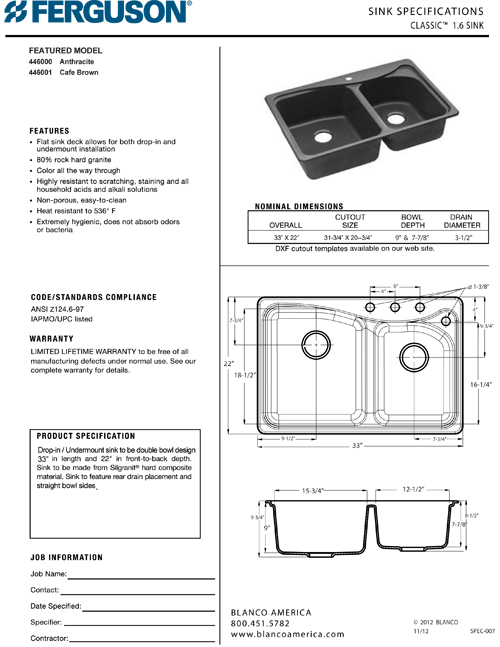 Product Specifications: Overall Height: 9" (measured from the bottom of sink to the top of the rim) Overall Width: 22" (measured from the back outer rim to the front outer rim) Overall Length: 33" (measured from the left outer rim to the right outer rim) Basin Width (Left): 18-1/2" (measured from back to inner rim to front inner rim on left bowl) Basin Length (Left): 15-3/4" (measured from left inner rim to right inner rim on left bowl) Basin Depth (Left): 9" (measured from the center of basin to the rim on left bowl) Basin Width (Right): 16-1/4" (measured from the back inner rim to the front inner rim on right bowl) Basin Length (Right): 12-1/2" (measured from left inner rim to right inner rim on right bowl) Basin Depth (Right): 7-7/8" (measured from center of basin to the rim on right bowl) Installation Type: Drop In or Undermount Number of Faucet Holes: 1 Drain Outlet Connection: 3-1/2" Minimum Base Cabinet: 35" Variations of This Sink: 446001: This model 446000: This model in Anthracite finish About Blanco: Blanco is a family owned company that has evolved over the better part of a century. Starting from humble beginnings making copper galvanized parts for cookers and heating elements, Blanco has grown to be a recognized leader in its industry. World renowned for producing the highest quality products, with the latest innovations and unsurpassed service, their products go far beyond mere functionality. 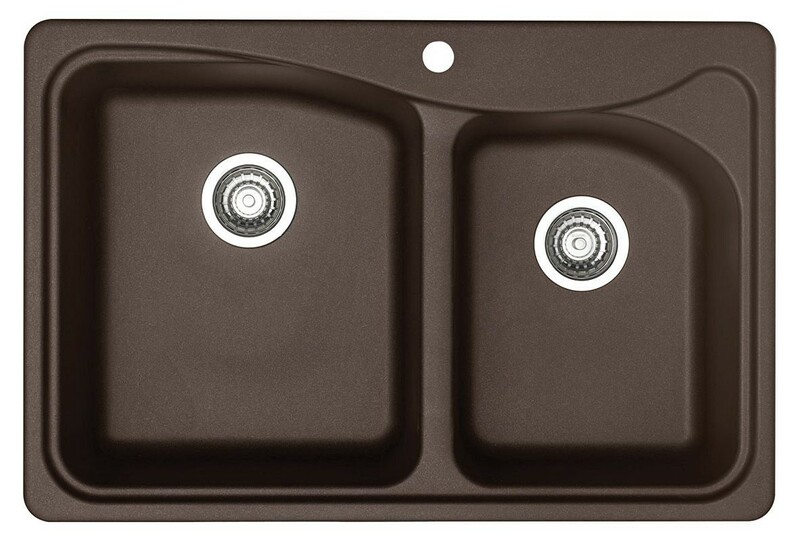 Having great pride in their dedication to quality, Blanco ensures that every sink is inspected multiple times before earning the brand�s name. Blanco also plays a major role in the practices of better business. Fully committed to the respect of moral business ethics Blanco is a member of the Caux Round Table, an international network of leaders in the business world working toward moral capitalism.